Australian Filling & Packaging Machine’s new premises’ lets customers assemble and trial equipment prior to installation. 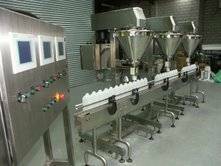 This includes powder fillers, conveyor systems, cap tighteners, check-weighers & metal detectors and other equipment required to fully complete a system. According to AFPM’s Paul Herbison; “Having a system set up is a logical step to allow systems to be run and complete initial training prior to installation at the client’s premises. “Setting up the operation of powder filling machines and liquid filling systems prior to site installation offers significant benefits such as layout confirmation, product flow and training, all with minimum downtime for installation. Machines Pty Ltd will be in touch as soon as possible. Fill by weight and Tolerance check.